Traveling to climb isn’t just about the climbing, but also the food, culture, different landscapes and weather. Several climbers asked us why we came all the way from America to climb in Turkey. I said once, “Because you can’t find Turkey anywhere else!” Yes, American climbing is good, and if we were concerned only about the climbing, then we could have stayed home and saved a lot of money. But climbing is such an immersive activity, and it’s oftentimes the non-climbing factors that make a great climbing experience. The view. Your climbing partner. The sunshine. The food. Rest day activities. The beer at the end of the day. These things matter. The little village of Geyikbayiri, just 30 minutes’ drive outside of the Mediterranean resort city of Antalya hosts Turkey’s largest and most well-known crag. It’s a little paradise. The forested valley sits below beautiful mountains. Streams flow and goats wonder about. Within a few square miles lie a handful of perfect limestone walls. The weather is not bad. The two weeks of 60 degrees and sunny weather was a nice contrast to our Seattle winter. And for rest days, beautiful Mediterranean beaches are only an hour’s drive away! The rock at Geyikbayiri is incredibly featured: a paradise tufas, pockets, and blobs. The climbing is playful and makes you feel like a child again. You’d find yourself pinching juggy tufas at 5.10, mounting stalactites at 5.11, and tossing between roof blobs at 5.13. It was quite ridiculous at times, moving over and through these large features. It’s a rare thing to experience it on such steep walls at moderate grades. This, I think, is what was special about Geyikbariri. There’s not many places in the world where you can climb pure tufas at 5.10+. For my routesetting, this was super inspiring, and an important reminder to keep trying to recreate this feeling of moving over and through large features, especially at easier grades. I wanted to have a more low-key trip and focus on enjoying the sunshine and time with my wife, Liz, so I decided beforehand not to get sucked into projecting. I wanted to see if I could go the whole trip without getting on the same route more than twice. I focused on the 13a to 13c range and gave 2-3 onsight attempts a day (onsighting means climbing a route first try with no prior information on how to do it). By the end of our two weeks there, I onsighted every 13a I got on, one 13b, and onsighted my first 13c. The trip ended up being my most productive sport climbing trip ever, without ever intending it to be. 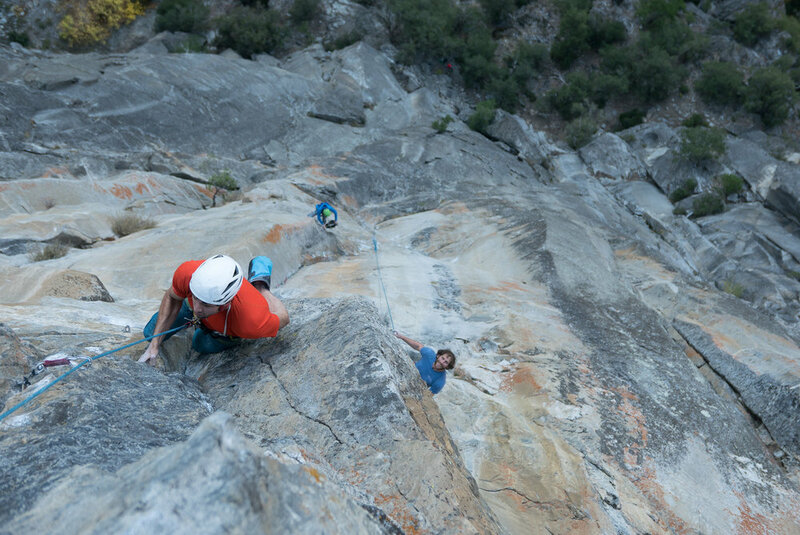 This style of climbing seems essential for keeping motivation high and improving skills. Not only was it fun to get on new routes every day, but I also felt the exercise increased the quality of my ability to adapt to the challenges each new route presented. Liz also had a good trip, sending her second 5.11 (on her second try, which means she needs to try harder routes!). It was her first long climbing trip and I’m lucky that she really enjoyed it, because that means we can do more!! Our next sunny Mediterranean sport climbing trip can’t come soon enough. Teenage girls sharing stuffed mussels in Antalya. Fitz Roy and Poincenot, early morning. I wasn’t sure what to expect going into my trip to Patagonia. I had just emerged from a period of low motivation and I wasn’t sure I was quite through with it yet. Would I feel like I was wasting my time and taking unnecessary risk? Was I going there just because it was the thing to do? Patagonia was a place I had dreamed of going to, but maybe I’d feel out of place…like I shouldn’t be there. I think I went at a good time though. With the skills and experience I’d acquired over the last couple years, Patagonia ended up feeling like something I could truly enjoy. I wasn’t overwhelmed by it. I was ready for it. I made safe decisions and I had fun. And it honestly was some of the most inspiring climbing I’d ever done. Five weeks were set aside for the trip. Pretty much the month of February. A good amount of time. Three weeks seems like the absolute minimum to give yourself a fair shot of climbing something, as the weather could be bad for weeks on end. With five weeks, I should for sure be able to climb something… Even then I wondered if I’d have enough time. I came into the trip with zero expectations. I knew that if the weather was bad in the mountains, you could still boulder in Chaltén, the town climbers stay in. That was the only expectation I did have. I joked that it would be my longest bouldering trip. I’d never been on one longer than a few days, but maybe the weather would be so bad that I’d just boulder for five weeks. I was prepared to be OK with that. That mindset proved to be a good one because the first two weeks I was there, I only bouldered. And it’s not a bad backup plan—the bouldering is really good. We met several climbers who traveled to Chaltén just for the bouldering. The pad situation, however, is not good, and I ended up mostly climbing on boulders that the locals had padded or climbing traversing problems low to the ground that needed little to no padding. The traverses got a little old by the end of the trip. It’s nice to climb up. The daily routine in Chaltén starts out with coffee brought from the States—because you can’t find good coffee down there—and reading weather forecasts. “When’s the next window?” was the question constantly in our minds. Often what seemed like a clearing a week out would completely disappear in a few days, and most “windows” would deteriorate in length and quality by the time they finally arrived. A couple times it looked like we were going to get a four or five day “mega window,” and both ended up being merely one, or maybe two separate days of good weather. There is a lot of pre-window talk down there. Everyone wants to know what everyone else is planning on climbing. But the talk was usually a waste of time because the weather changed so much. Before most windows, we didn’t have a solid-ish plan till the day before. One time we didn’t decide which side of the range we’d hike into until 30 minutes before leaving. Finally a three day window arrived—really just two good days with a bad day in the middle. The first day of that window was going to be too cold to rock climb, so Austin Siadak—my main climbing partner for the trip—and I decided that we should go for a “winter” route—basically a route we could climb in boots, crampons, gloves, and ice axes, verses “rock climbing” with bare hands and rock shoes. We decided to try the Whillans-Cochrane on Poincenot. Poincenot, the third highest peak of the Torre and Fitz Roy spires, is one of the most beautiful in the Fitz Roy group. 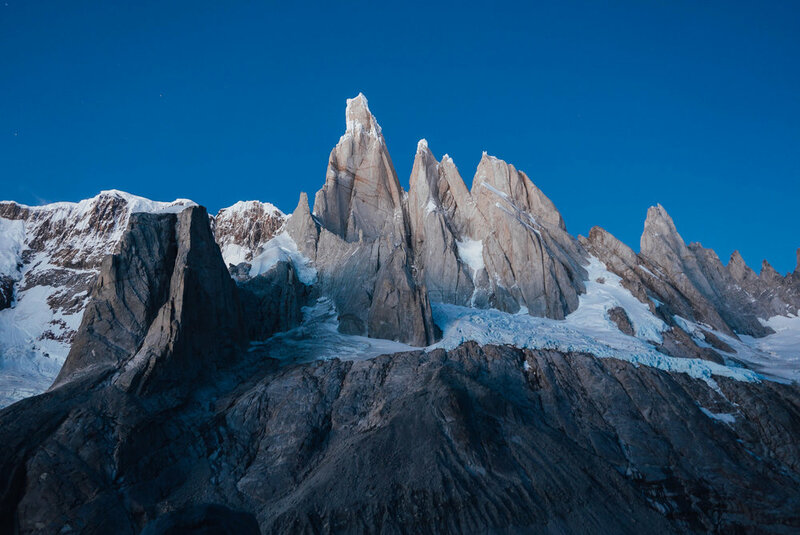 Its prominent and piercing spire competes with Fitz Roy (Cerro Chaltén, as it’s locally known) itself. Due to recent warm weather and storms, the snow ramp leading to the start of the “technical” climbing was melted out and then covered with fresh storm snow. We arrived at the base of the route as several parties were bailing. The loose snow over rock didn’t look ideal. I was psyched to have Austin’s Patagonia experience for what turned out to be an earlier-than-expected crux at the beginning of the route. If it weren’t for him, I would have joined the fleeing parties. Once we made it to the mixed “crux” (M4 or 5 in the current conditions), I took the lead, only because I felt bad about all the leading Austin had been doing up to that point. After navigated a scary slab in crampons, we were cruising on solid rock and good ice—comfortable territory for both of us. As we rounded the mountain and made it to the summit, I got my first views of the Torres—some of the most beautiful spires of rock in the world. Even though I never got to touch rock with my bare hands and rock shoes, Poincenot was an amazing and very memorable first Patagonian climb for me. 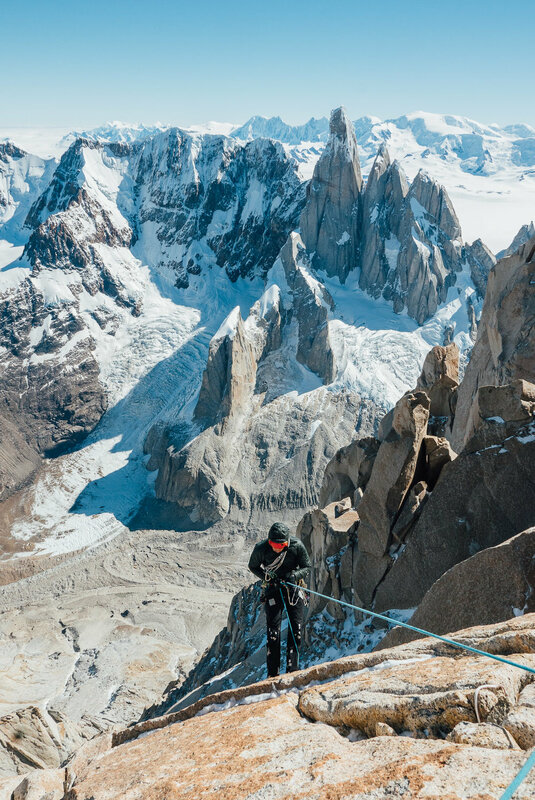 It was also important for Austin—it was the last spire in the Fitz Roy skyline that he had not climbed. Austin rapping off the summit of Poincenot with the Torres in the background. 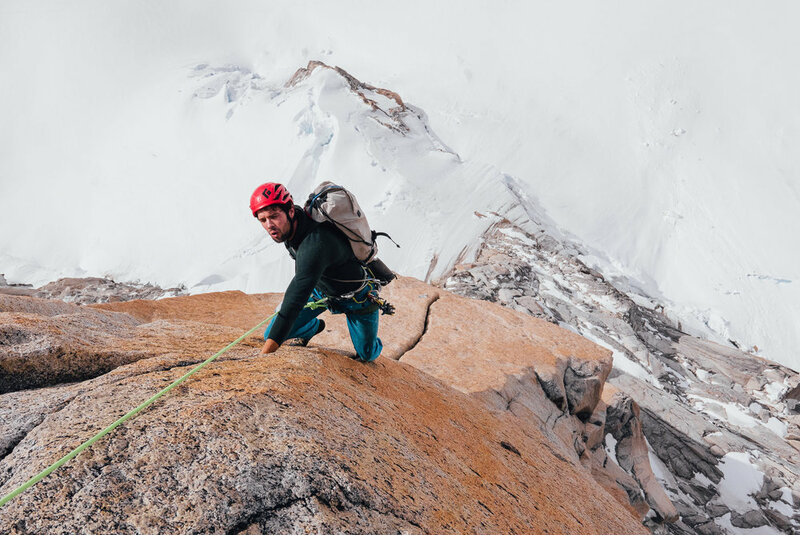 After Poincenot, Austin and I rested out a rainy and windy day in high camp and prepared to attempt Aguja Pollone with Colin Haley and Andy Wyatt the next day. We planned to climb a route called La Granja via the Japanese direct start as two teams of two. The pitches on this route ended up being some of the best alpine rock pitches we’ve ever climbed. Splitter hand and finger cracks, and hero jug flakes. The whole route follows a prominent eastern arête that juts out over an epic glacial landscape. The quality of the climbing, the beauty of the line, the mountain, and position make this route destined to be a classic. The whole day was type‐1 fun—a rarity in such serious mountains. Austin on one of the many amazing pitches of La Granja. Back in town, we did more bouldering and trail running and religiously checked the forecasts for the next window. The scene in town is beautifully social—lots of climbers hanging around and waiting for good weather. El Chaltén is small, but because of its booming recreational appeal as the “trekking capital of South America,” it has many small grocers, cafes, restaurants, and even a brewery. Most days in Chaltén ended with happy hour at “Fresco,” where climbers gather and share stories of the last window, celebrate successes, and bond over surviving another day in Patagonia. Josie trying to decide if she wants to go for it. Later that week we got a small blip of good weather—not enough time to spend a night in high camp—so we would have to get in and out of the mountains Chaltén-to‐Chaltén. Andy and I decided to team up to do a quick climb of Guillaumet, a mountain neither of us had climbed and one of the most accessible for a town-to‐town mission. Andy is the owner of the climbing gym I routeset for and super talented athlete. Him and Colin Haley set the car-to-car speed record of Fitz Roy and, back in Washington, Mt. Stuart's North Ridge. I was excited to see if I could keep up! Andy low on the ridge. Andy at a belay after the crux pitch of the Fonrouge. Three weeks had flown by and I was beginning to feel like I was running out of time. Eventually some promising weather showed up on the horizon. But first more bouldering, trail-running, and happy hour-ing. The line goes straight up a tall and clean 40° overhang with cool holds and great movement—about all you could ask for. When I walked up to people trying the line, most of the climbers were taking epic falls from the top, missing the pads, and thankfully being caught by a large group of spotters. I assumed someone had already climbed it and I gave it a few tries, dropping off each time because I was scared. Then I heard that it actually hadn’t been climbed yet, so I decided to give it a little more effort. After a couple more tries, I found a body position in which I felt in control, committed to the last few moves, and pulled over the lip. I felt like I was competing again, and it brought back a exhilarating memory of a cheering crowd when I was the only person to send a route at nationals. I called the line La Puerta Abierta, “The Open Door,” upon recommendation from Austin who heard someone yell, “the door is open!” after I topped it out. The name also recognizes those who worked hard to prepare and save this boulder for the festival. It’s about V9, with maybe a half-grade granted to it due to its committing nature. Finally, in my last week, some good weather came and Andy, Austin and I decided to try a route out of the Torre Valley. We attempted “Last Gringos Standing” on St. Exupery, but only got a couple pitches up before bailing because of wind and cold. I think that day turned out to be much colder than expected and a number of parties had to bail. Perhaps we could have chosen an easier and more sheltered route, but I’m not sure we could have known how bad it would be. Our one failure still ended up being a great camping trip—the Torre Valley is likely the most beautiful place I’ve ever been in my life. The Torres at dawn from the Torre Valley. After hiking out of the Torre Valley in a storm, I only had a few days left before my flight back home. The forecast showed one last day of good weather the day before I had to catch a 6am bus to the airport. If we went for something big, I would likely have to hike solo across a broken glacier and navigate a descent I’d never done before in the dark. It would be a bit risky and a bit of a gamble with the possibility of missing a very expensive flight. But there was one route, the Pilar Rojo on Mermoz, that I really wanted to climb, so Austin and I decided to go for it. At high camp, a couple good friends from Seattle, Andy and Kelsey, offered to help me get out of the mountains safely and in time for my bus. They had a car and would wait for me to get back to the road via a trail I knew well, and drive me back to town, so I wouldn’t have to navigate an unfamiliar technical descent on my own. I didn’t have access to a car and it would’ve been too late to get a taxi, so I hadn’t considered this option, but it was a huge relief when they made it possible. The next day Austin and I successfully climbed the Pilar Rojo with four of our other friends right behind us. We almost onsighted the consistently 5.11+, 2000‐foot climb, except for a short slab traverse that Austin aided through and I sent third try. It was a battle to keep it together for the last bit of burly crack climbing—Austin was cramping up and I just felt super tired. The climbing was the definition of “splitter,” almost too splitter for me, a pretty mediocre crack climber. We got off the mountain in the light and I ended up making it back to town by 3am. After a two-hour nap, I caught my bus to the airport, and was quickly transported back to Seattle. I felt extremely lucky to end my trip with such a high quality Patagonia free climb. 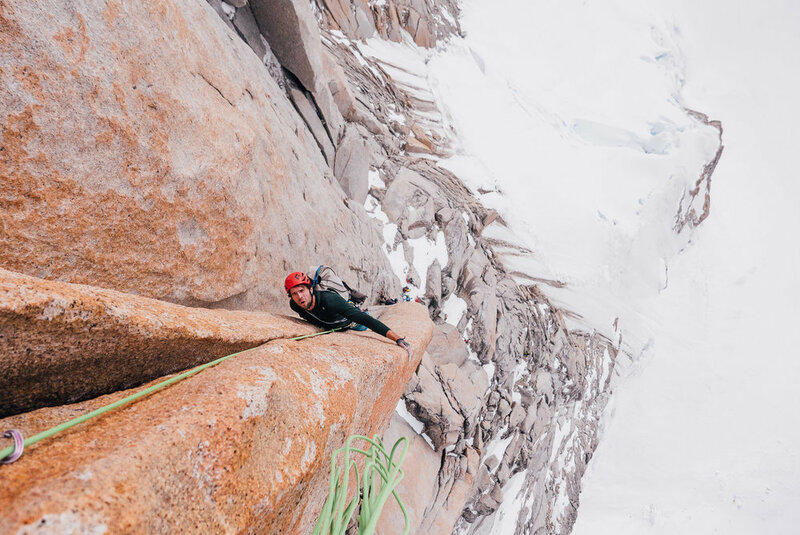 It’s possible that that last day was the only day that conditions aligned enough to make climbing the Pilar Rojo possible. A couple of our friends had attempted that route several times that season and never got a chance to take it to the top. Austin on the first 11d pitch. Splitter! Austin on one of the only 5.10 pitches. Splitter hands for 200 feet! Naturally, I wonder if I’ll go back to such an amazing place. When I was down there I was already talking about being back next year. Back home, I wonder if I’d like to use my “big trip budget” to see another part of the world. I’m sure I will eventually go back, but I’m not sure when. I honestly was surprised at how high-quality the alpine granite was—it really is good. But what wasn’t surprising was how hard it is to get good conditions to rock climb—Patagonia’s stormy reputation is extremely accurate. That’s partly what makes it special though, and also what would make a rock climber like me second‐guess going back! Doing a rad alpine rock climb down there is not guaranteed, but I was lucky to do a few. Chaltén below a shrouded Fitz Roy. Middle Cathedral (left) and El Capitan. 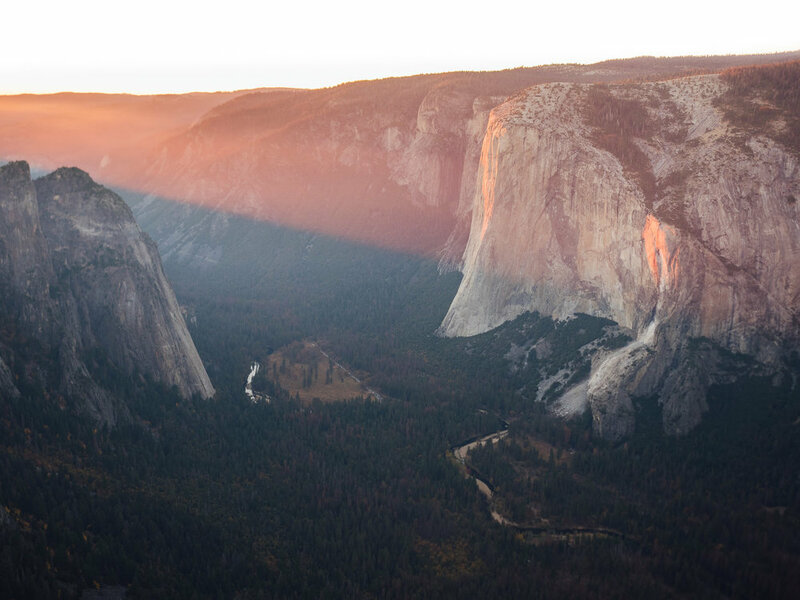 When you drive into Yosemite Valley, El Capitan is one of the first things that you see—one of the most beautiful hunks of stone on the planet, and the object of many climbers’ dreams. And this definitely goes for me. I too am irresistibly drawn to climbing’s Great Supermodel. And so it was my plan to get intimate with the Supermodel this last October. I hadn’t been to the Valley in 10 years—the last time I was there, I was 15. Now, in my great climbing maturity, I was ready for the Captain. And I believed I was ready to free climb it. But unfortunately for me, due to heat and crowds, the trip ended up being a tour of some hard and classic free climbs on the shady side of the Valley. Blake Herrington and I arrived in El Portal late on a Friday night, October 20th. The plan was to sleep in a bit and get a casual start for a route on Fifi Buttress. Blake wanted to get on Romulan Warbird (V 5.12c), but I wanted to go straight for Final Frontier (V 5.13b). Blake put forth that we should start slow and I had to relent. I was probably being too ambitious. The next morning, we were at the base of the route at a causal 11pm, with our friends Nik Berry and Bronson Hovie 2 pitches above us. “How was the first pitch?” I yelled up at Nik. “Kinda hard. And the rock doesn’t feel very grabby.” Blake and I tossed a carabiner for the first lead. The CAMP side landed up and the 12b warmup pitch was all mine. I eked through it, and so did Blake, and we continued to eke our way through the rest of the route, including two more pitches of 5.12. The climbing was amazing, and the belay ledges were even more amazing—key ingredients for a classic free climb. I would climb this route many more times, and was glad Blake pushed for it. It was a great way to start our trip. Coming from Washington, and especially coming from climbing at Index, it was a relief to be able to climb 5.12 pitches on granite first try fairly comfortably. (5.12 is also no gimmy at “local” PNW crags like Little Si, Squamish and Smith!) Not very many climbers have onsighted Index 5.12, and by the end of our first day, I had already onsighted more 5.12s in Yosemite than I had ever at Index. Two days later, we were back at Fifi Buttress for Final Frontier. We were psyched to have some 5.11 pitches to warm-up on this time. When arrived at the crux block of 12d, 13a, 13b, and 12c, we were psychologically taken out by poor stances and poorly situated belays. The anchor bolts were always just left or right of the stance, so that you were forced into a hanging belay with ledge just out of reach! I onsighted the first 12d, sent the 13a, and felt close on the 13b after one try, but Blake wasn’t as close to sending and we were both a little irritable from having to hang in our harnesses so much, so we called it and rapped from the base of the 12c. Several days later, I returned with my friend Austin Siadak to finish the route and lead every pitch with no falls. Almost all of the pitches on this route are amazing. Nik Berry and James Lucas did a nice thing by freeing this route, though I have a slight grudge against them for not making the belays more free-climbing friendly. Alas, it is all of our responsibly though, and I could have done it myself. Austin on Final Frontier, with Max and Blake below. We wanted to climb the next day but didn’t want to hang in our harnesses at all so we decided on the Rostrum (IV 5.11c), which supposedly had good ledges, not-to-mention it being a Yosemite classic. The night before climbing it, Austin, Blake and I sat in the living room of our place in El Portal discussing how to climb it most efficiently as a team of 3, and decided to try climbing the route in 5 long pitches, leader fixing, and the two followers following simultaneously on mini-traxions. We called the middle follower the parasite. This ended up working well. On a somewhat non-meandering route, the two followers were not pulled to the side at all. Blake and Austin said that even following the traverse on the last pitch was smooth. After leading a 200ft pitch, the leader could just chill, and work on a crossword puzzle, or some other productive thing. No trying to belay two people simultaneously, and since we only needed one rope, and because it was always just hanging straight down below us, there was literally no rope management work necessary. Just long glorious pitches. We were slowed down a bit by a team from Norway, but we’re good friends with them now, and found out that the granite in Norway is better than Squamish and Yosemite. But what about Index? TBD. I think we started at 1pm and finished around 5pm. After the Rostrum, our friend Max Tepfer arrived in the Valley. It was still quite hot, and wanting to try a route on a different formation, we decided on Border Country (V 5.12c) on Middle Cathedral. Blake used a random number generator on his computer to decide who would climb with who. On this party ascent, I’d climb with Max, and Austin would climb with Blake. Max and I simuled the first 7 pitches to the crux headwall in 3 leads. The intro pitches were fun featured 5.8-5.10 face climbing, but the real gems of this route are the 4 headwall pitches of 12a, 12c, 11+ and 11+. Max wanted to lead the 12c, which he had tried before, but hadn’t sent, so we decide to swing leads with me starting with the 12a. I onsighted this pitch and after watching Max’s beta for the low crux on the 12c, flashed that as well. The 11+ pitches went smoothly for both of us and we stopped back at the crux 12c on our way down so Max could re-lead and send. Blake and Austin were above us at this point and Austin took one of the better iPhone photos I’ve seen of Max hiking the thing in the day’s last glimmers of light. Send of the day. The features, the knobs, odd pockets, and ribs were amazing. Those four pitches contained some of best, most interesting granite I’ve ever climbed on. Thanks Jeremy Collins, Dana Drummond, and Mikey Schaefer for the beautiful route! At this point in the trip, after about a week, I knew El Cap was not going to happen. I wasn’t feeling much psych from Blake, which was reasonable because it was so warm. It was supposed to cool down after my wife, Liz, was going to arrive, and but I didn’t want to leave her to hang out alone for her first few days of her first trip to Yosemite. I talked to Josh Wharton and Nik Berry a bit about coming back later in November to have a shot at it, but they both either found partner before I committed or had an old partner come through later. Freeing El Cap was a big goal for 2017, something I really wanted to do, but it wasn’t meant to be. Good thing it’s not going anywere. Monday, October 30th, was the last day I had to give another hard route a shot before I had to pick Liz up at the Sacramento airport that evening. Max had been working on the Westie Face (V 5.13a A0) of the Leaning Tower the previous season and was psyched to get back on it. I was pretty sure I had a good chance at sending it in a day, and maybe even a slight chance at an onsight. It was at least not out of the realm of possibility. Max’s goal was to re-remember the moves, so we decided I would lead most of the route. The day before getting on the route, Max and I hiked up to the base to fix the initial 200ft bolt ladder that gets you into the free climbing. We rock-paper-scissored over who would lead it and I lost, which was probably a good thing because I had literally no aid climbing experience and a 200ft bolt ladder would probably be a good start. It felt like it took forever, even after getting into a rhythm of it. Without a hook, I had to pull a mandatory free move over a roof, that actually felt kinda hard in approach shoes. I made it through though and we were ready for a speedy ascent the next day. With a 5:30am alarm, we were probably at the base of our fixed line by 7:30am. We ascended our line to a hanging corner, several hundred feet off the ground. It was an intimidating start, needless-to-say, with 12c difficulties right off the belay. I didn’t handle the exposure and pressure to send very well and felt pretty shaky. I made it through the first cruxy moves but punted when I shook myself off a small foot. Blew the onsight. I lowered to the belay and yo-yo back up to where I fell before and finished the pitch. The next pitch, the crux pitch, contains two cruxy sections separated by a stance on a slab, a first one at around 12d, and a second at around 13a. As I was about to exiting the first crux, I tightened up, stopped breathing, and fell. I lowered, pulled the rope, and immediately got back on the pitch, still quite pumped. I relaxed my way through the first crux and onsighted the rest of the pitch, including the 13a crux. Having climbed the first two pitches almost twice each, I was already a bit tired and pumped with 4 more pitches of 5.12 and one 11+ to go. But the crux was behind me so I was pretty confident it would go. Sure enough, the rest of the pitches went first try. We topped out around 2pm and I was pretty pooped from all the steep climbing. I think I had been carrying a low-level flash pump with me the whole day. I was glad to send, but a little bummed about my poor performance on the first two pitches. We were back in El Portal by 5pm and I was at the Sacramento airport by 9pm to pick up Liz and back in El Portal after midnight. A long day, but good last day of hard climbing! For the rest of the week, I was able to enjoy some of Yosemite’s classic moderate routes with Liz, like the East Buttress of Middle Cathedral, Nutcracker, and Serenity Crack. It was early November and the Valley was starting to clear out and quiet down. It was a fitting way to end the trip, but seeing El Cap everyday, and knowing that it would have to wait, made me a bit sad. But for now, I had had a great first “mature” trip to the Yosemite and a most excellent tour of the darker side of the valley. Liz on the East Buttress, Middle Cathedral. Moody day on Middle Cathedral.